I am heading off to Hungary on Friday week to play at a festival in Gyor, Hungary. Just researching events from this side of Europe beforehand etc. In a side chapel of the cathedral of the Diocese of Gyšr, in the city of Gyšr, in Hungary, is a beautiful picture of our Blessed Lady and Child, which the people of that country call The Irish Madonna, and which they venerate under the title of Comforter of the Afflicted. It is there since the seventeenth century, and was once the cherished possession of an Irish bishop, Dr. Walter Lynch, who was bishop of the diocese of Clonfert from the year 1647 to his death, in exile, in Gyšr on the 14th July, 1663.
Who was this bishop Walter Lynch and how did he happen to die there so far away from his diocese in Ireland? While there is no precise recorded knowledge as regards the date of his birth or of his family, it is accepted that he belonged to an important Galway family of Norman descent, and that he was born in the early part of the 17th century, in the city of Galway. He received his early education in Galway and then, because it was not possible in those days in Ireland, he had to go to the continent of Europe to train for the priesthood, where in due course he was ordained a priest. He returned to Galway and took up his priestly duties in his native city. At that time there was no diocese of Galway. Instead there was in the city what was known as the Wardenship of Galway, centred on the Collegiate church of St. Nicholas to which a number of neighbouring parishes were attached. The principal priest was known as the Warden. In due course Dr. Walter Lynch was appointed Warden. On the diocese of Clonfert becoming vacant, following the transfer of Bishop John Burke to the Archdiocese of Tuam, Walter Lynch was appointed bishop of Clonfert in March 1647. It was a very disturbed and difficult time in Ireland in those days. A state of war was in existence since the Rising of 1641, when the Catholics began their attempt to gain religious freedom and to try to win back the lands taken from them in the plantations of the previous years. At this time the struggle was being carried on by the forces under the direction of the Catholic Confederation formed earlier in Kilkenny. Bishop Lynch soon became involved and took an important part in the deliberations of the Kilkenny Confederation. He appears to have been highly esteemed among that body. However, owing to disunity and divisions within the Confederation, and the arrival of Oliver Cromwell with an army of 20,000 men, and the untimely death of Owen Roe OÕNeill, the ablest leader of the Confederate forces, the Catholic cause began to fail and eventually collapsed. Bishop Lynch was forced to leave his diocese and took refuge in Galway City. After a fruitless resistance, Galway had to surrender to the Cromwellian army. Meanwhile, to avoid capture, Bishop Lynch had left Galway and made his way to Innisbofin, from where he eventually succeeded in getting away on a ship to the Continent of Europe, and eventually found asylum in Belgium. It is not known how long he stayed in Belgium, but it is on record that during his time there, he ordained a number of his fellow countrymen in the priesthood. Little else is known about his movements or how long he remained in Belgium, but in 1655 he had come to Vienna. It was here that he met a Hungarian bishop, who was to befriend and invite him to come to his diocese. This was Bishop John Pusky, Bishop of Gyšr. On his coming to Gyšr, Bishop Pusky appointed Dr. Lynch a canon of his Cathedral Chapter, and also had him assist in the work of his diocese. Meanwhile conditions had begun to improve for Catholics at home in Ireland. Cromwell died and the king, Charles II was back on the throne in England. There was some relaxation of the laws against Catholics, so that Bishop Lynch decided to return and resume his diocese. Sadly, however, he was destined never to see his native land again. As he was preparing to set out on his journey home to Ireland, he died unexpectedly on the 14th July 1663, in the city of Gyšr, which had given him welcome and hospitality in his exile, and there his body now lies. Amongst the few personal possessions of Dr. Lynch at the time of his death was a beautiful painting of the Madonna and Child. He is said to have had a great love and devotion for this picture. After his death the picture was placed over a side altar in a side chapel in the Cathedral. It is still in the same place today but now in a beautiful shrine richly adorned. It would, probably, have remained there without receiving much notice or honour, were it not for a very wonderful occurrence there on St. Patrick's Day, thirty-four years later. What happened on that day was to gain for the picture nationwide attention and make it a source of great devotion to Mary, Comforter of the Afflicted and its shrine a place of pilgrimage ever since. This is what is believed to have happened. Early on the morning of the 17th March 1697, as Mass was being offered in the Cathedral, what appeared to be a sweat of blood or of tears was noticed on the picture. Naturally this caused great excitement and a feeling of awe among the people who were present. Following this strange and seemingly miraculous event, devotion to the Irish Madonna, as it came to be called, grew greatly. A special shrine was made and adorned for the picture. It was only then, since now it had become a much-honoured shrine, that the crowns were added to the heads of each of the figures. The centenary of the occurrence was celebrated in 1797, and the second centenary in 1897, and in 1947 the 250th anniversary was celebrated, when it is estimated 100,000 pilgrims visited the shrine. If one accepts as real and true what is recorded to have occurred in Gyšr Cathedral on St Patricks Day, 1697, one might well ask why such a thing should happen, or wonder was it a sign from heaven. God alone knows. There is, however, a strange and significant fact that would incline one to think that it was a sign from God. The fact is that on that very day and date, the Protestant Parliament, then in power in Ireland, convened in Dublin and began to introduce and pass the most iniquitous laws, known as the Penal Laws, which were designed to put an end to the practice of the Catholic religion in Ireland and deprive the Catholic people of all their civil rights. Was it, then, a sign of our Blessed LadyÕs concern and sorrow for the people of Ireland who were to suffer so much during the years that were to follow. Who knows? All we can do is wonder why such a thing should happen, and thank God and Its Blessed Mother that, in spite of all they had to endure, they survived and remained true to their faith. The people of Hungary, too, have had to suffer for their faith in later and in more recent times, and they, too, have remained faithful. Devotion to Mary, the Mother of God, is a notable feature of both our nations. May they and we continue in our devotion to Mary, and may her shrine in Gyšr continue to remind us, how an exiled Irish bishop found welcome and hospitality in a foreign land in those far off unhappy days. The seminar coincides with an Irish cultural festival in Győr to be held on the weekend of July 12th and 13th (further information below). 12.30 Depart for Audi Hungária Motor Kft. 13.00-14.30 Visit to Audi Hungária Motor Kft. One of the most important suppliers of engines for Audi and the Volkswagen Group. The Hungarian subsidiary produces four-cylinder, V6 and V8 engines and, in cooperation with the Ingolstadt plant, assembles the TT Coupé, the TT Roadster and cabrio A3. To register for the event, please contact Katarina Szabova at Enterprise Ireland before Friday 27th June 2008. Email: katarina.szabova@enterprise-ireland.com tel: +36-1-301-4950. In the framework of the annual European cultural program "Dialogue between Cultures" the Győr mayor's office is organizing an Irish Festival in Győr. At a press conference, Deputy Mayor Rudolf Ottofi said that the aim of the festival is to revitalize the 300 year old cultural-religious connection between Ireland and Hungary. The leader of the city said that the Irish-origin devotional painting of the Virgin Mary exhibited in the Győr Basilica represents the closest link between the two countries. Bishop Walter Lynch carried the painting from Ireland to Hungary in the middle of 17th century. The Bishop died in Győr on 14th June, 1663. According to legend the picture carried by him to the basilica started bleeding tears on 17th March 1697, on St Patrick's Day. This summer festival is linked to the day of his death and the festival is connected to his name. This cultural program offers opportunity to build connection between Irish and Hungarian educational, artistic and religious institutions; there will also be a choir festival and exhibitions. A group of pilgrims from Ireland will attend. there are also plans to make a documentary film on the religious connection and a book on the 300 year old historical link. During the festival there will also be a festive mass in the Győr Basilica. Conference organised by Győr-Moson-Sopron County Chamber of Commerce and Industry, and Enterprise Ireland, supported by Enterprise Europe Network and Győr County Level City Government. Venue: Richter Hall, Győr, Aradi vértanúk tere 16. Above is photo of Fiachra's missing fiddle and bow, a distinctive and unique black fiddle with ornate purfling and animal's head, which was left behind in a black case at a bus stop on Mobhi Rad in December 2007. The bow is a black cromite bow. A reward is offered leading to it's return. It's about 20 minutes in. 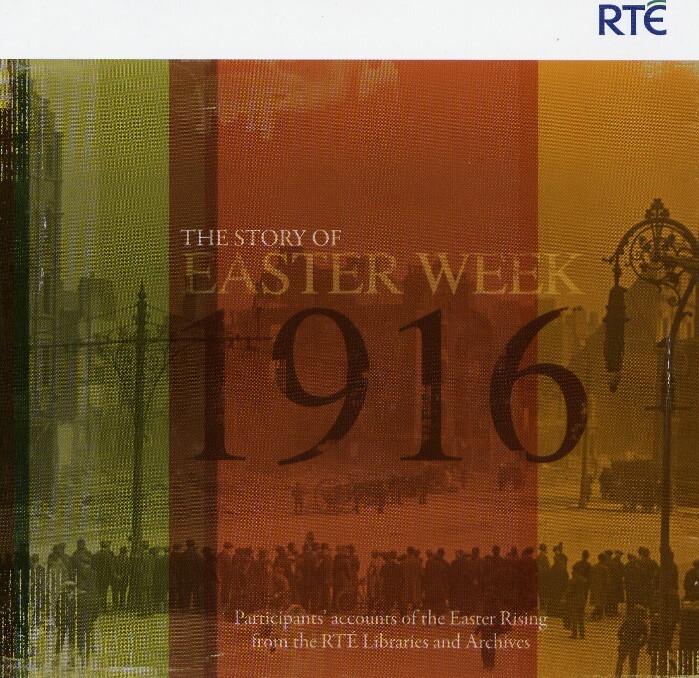 from the RTE Libraries and Archives. On the 31st of May, the RTE radio programme "The Eleventh Hour", introduced by Páraic Breathnach, will focus on the two recently published books on Séamus Ennis - Pat Mitchell's The Dance Music of Séamus Ennis and Ríonach Uí Ógáin's Mise an Fear Cheoil. The programme will include interviews with the two authors, and contributions from Seamus's son Chris Ennis, and from Neillidh Mulligan and Peter Browne, both of whom will also play the pipes. On Wednesday, 11th of April Members of Comhaltas Ceoltoiri Eireann, Maothail gathered with invited guests to launch the first Mohill O’Carolan Weekend at the beautiful grounds of Lough Rynn Castle Hotel which is to be the setting for the performance by The National Harp Orchestra directed by Dr. Janet Harbison. This concert will take place on Sunday 6th May at 3.00 p.m.
Chairperson of CCÉ, Maothail Councillor Enda Stenson welcomed the gathering and explained the background of the Mohill O’Carolan Weekend. In 2006 CCÉ, Maothail had hosted Fleadh Cheoil Liatroma and as part of its opening ceremony had been delighted to present Dr. Janet Harbison and the National Harp Orchestra. Such was the reception from the crowds and the media both local and national, that the branch as part of its programme for 2007 invited Dr. Harbison and her wonderful orchestra back to be part of the inaugural Mohill O’Carolan Weekend. Councillor Stenson explained that Mohill has a long association with Turlough O’Carolan, the blind harpist, reputed to be the first great Irish composer. It is most fitting that the branch should celebrate and commemorate a musician with local connections O’Carolan’s only permanent home being but a few miles from the town on land given to him by his patrons the Crofton family of Lakefield House Gortletteragh. A project such as the ‘Mohill O’Carolan Weekend’ will allow locals and those who travel from afar the opportunity to hear some of the work of O’Carolan which has survived and has been celebrated and enjoyed for over two hundred years. Mohill is the place to be on May 5th –May 6th. The weekend starts on Saturday afternoon with workshops being given in the Vocational School, Mohill from 10.00a.m. – 1.00p.m. · Parents are encouraged to bring along their children to experiment with baby harps (kindly provided by Dr Harbison) with the view to cultivate further interest in harp music. Sean Ward, Joe Mc Govern and friends and members of the Mohill Singers Club. CCÉ, Maothail believe that this will be a weekend of wonderful music, song and craic framed against the beautiful backdrop of Lough Rynn Castle Hotel with its elegant fairways, copses, nature trails and lakesides walks. 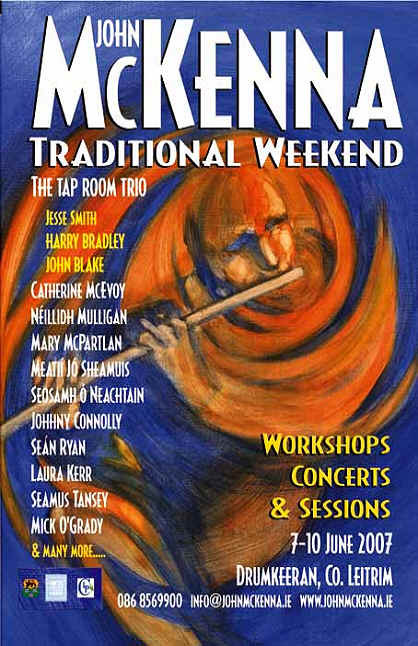 Mohill O’Carolan Weekend is a must for all music lovers and CCÉ extend a warm welcome to all. The branch is extremely grateful to the management of Lough Rynn Castle Hotel and the Hanly Group for their support and assistance in hosting this event and Leitrim VEC for the use of the Vocational School, Mohill. On Monday 7th the Harp Orchestra will be going on a tour of O’Carolan Country and will be visiting all sites associated with the famous harper. They will start the tour from Hatley Manor, Carrick-on-Shannon, the home of the St. George family where O’Carolan’s father was employed as a farmhand and blacksmith. While there they will play the traditional tune “Molly St. George”. At Alderford House, they will play “Mrs McDermott Roe and Carolan’s Farewell to Music”. At Kilronan Cemetery, (his burial place) they will play “Nach í seo an chuairt easbhach” (Marbhna Chearbhallain le Cahaoir Mac Cába). 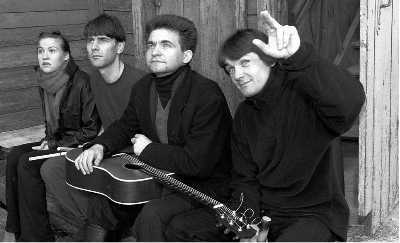 At Letterfine they will play “George Reynolds”. At Laheen they will play “Tobias Peyton”. At Fenagh they will play “Lament for Charles McCabe”. At Drumboy they will play “Carolan’s Cottage (Alloa house). At Mohill they will play “William Eccles”. At Lakefield they will play “Miss Crofton”. This year’s Midwinter Night’s Dream festival is dedicated to the centennial anniversary of professional theatre in Estonia. For the occasion we have invited guest performers from very different parts of our world – with participants arriving from Japan, Africa, Russia, Iceland and Ireland. The main theme of the festival is the art of storytelling and the migration of people and stories. In addition to performances we will offer you workshops and encounters with our guests – the Kusum Gboo Dance Ensemble will teach us about African music and dance, Russian scenographer Dmitry Krymov will reveal to us some secrets of his creative laboratory, Estonian playwright Jaan Tätte and his colleague from Iceland, Jón Atli Jónasson, will discuss the great stories of small nations, and Japanese actor Issey Ogata and director Yuzo Morita will tell us about their working methods and acting techniques. The workshops were initiated with theatrical professionals in mind, but they are also open to the general public. The artistic director for this year’s festival is Jaanus Rohumaa. Issey Ogata, a master of one-man theatre, and his director Yuzo Morita have worked together for more than thirty years. Having participated in student demonstrations in his youth and worked in the early years as a janitor and construction labourer alongside his acting, Issey Ogata is familiar with many different sides of life, and it’s mainly among ordinary Japanese people that he finds characters to depict on stage. In his shows one can see commuters stuck on crowded trains, bartenders cheerfully waiting on an almost empty house, impertinent pizza delivery boys, and widows in love – ordinary people, who are still somehow different from the others. Slipping from one role to another with enjoyable ease, Ogata brings out the wittier and funnier side of everyday life – therefore it’s not surprising that he is extremely well loved in his home country. In addition to theatre Ogata often performs on television, and apart from Asia he has toured the US and in Europe. He has also acted in films both in Japan and abroad, recently playing the Emperor Hirohito in Alexander Sokurov’s film “The Sun”. The performances are in Japanese, with synchronous translation into Estonian and English. A collaborative creation. Opus No 2. Dmitry Krymov is a renowned Russian scenographer and professor. In studying the possibilities of visual theatre, a few years ago he and his scenography students created a production called “Not a Fairytale”, where the very same students participated as actors. Anatoly Vassilyev, the artistic director of the School of Dramatic Art, noticed the production and he offered Krymov the opportunity to establish a creative laboratory at his theatre. By today the laboratory, made up of students of scenography and some young actors, has already created five different productions. “Donky Khot” is a fantasy based on “Don Quixote” by Miguel Cervantes – it’s a story about love, hatred, loneliness and death; a humorous and moving performance about a man who is different from everyone else. The creators of “Donky Khot” have said that the performance is meant for people who understand the theatrical language, but also for those who have sometimes felt that they’re different from the crowd. “Donky Khot” is a mixture of different styles – drama, stage movement, dance, song, shadow theatre, puppet theatre and happening. The performance doesn’t need any translation. The Kusum Gboo Dance Ensemble will deliver our festival a hot vibe, travelling here from Africa, the cradle of humanity, to bring to us stories about the creation of Man and world, and colourful dance numbers from the rich cultural heritage of Ghana. “Somu” is a word in the local Akan language, loosely translated as “hold on tightly to whatever you possess”, calling on all Africans to embrace the traditions they have inherited from their forefathers. The director, Richard Danquah, was very active in protecting and promoting African dance and culture during his entire lifetime. In addition to Ghana he also gathered knowledge and experience form Benin, Benin and Burkina Faso, and Kenya. Kusum Gboo is one of the most renowned ensembles of traditional dance in Ghana, and they have toured with their performances in several European countries. The Kusum Gboo drummers will also contribute to festival life by participating in the evening jam sessions at the festival club. The verbal section of the performance is in English, with translation into Estonian. Iceland is indeed a land of theatre – statistically they have the highest percentage of theatre-goers in the world. During recent years Jón Atli Jónasson’s play called “Surf” has been performed with great success in many European festivals. Midwinter Night’s Dream is proud to present his next play, “A Hundred Year-Old House”. In Iceland the play is performed in an old hospital tent that has been abandoned by the British military. The central characters are three old people sharing a room at a nursing home. Together they try to keep alive their memories about a world that is becoming more and more alien to them, and seek each other’s company in a struggle to stay alive, while at the same time longing for another life, another world. The play is written in the form of the evening gatherings which are customary in Icelandic farms, even reminding us sometimes of a wake. The characters tell stories, dance, reminisce, listen to music, drink whiskey, eat sweets, and try to read a Norwegian book about death. The performances are in Icelandic, with Estonian and English subtitles. Ireland is a land of fairytales, poetry and folk music. Renowned uilleann piper, Néillidh Mulligan, and one if Ireland’s best-known contemporary playwrights, Vincent Woods, present a programme including all of those three components. It is a friendly gathering, comprising traditional music, stories and poetry from ancient tradition, framed in the context of modern music and literature. Two performances are meant for grown-ups and two for children. Néillidh Mulligan has been in contact with traditional music since his childhood, being a son of an acclaimed fiddle-player and piper. Mulligan has been described as a piper who is sure of his touch and who plays with warmth and emotion. He has worked as a teacher and musician, participated in many festivals, worked in television, theatre and film, and has released three solo albums. Since his first visit here in 1988, he has been a regular performer in Estonia. Vincent Woods is a renowned playwright, whose work has been staged both in Ireland and abroad. His plays include “At The Black Pig’s Dyke” and “A Cry from Heaven”, which draw on old traditions and myth to tell powerful stories with strong resonances for today. He has also published several collections of poetry. The performances are in English, with translation into Estonian. Mart Koldits, who graduated from the Estonian Academy of Music Drama School in 2004, is the youngest director at Tallinn City Theatre. In his latest production, “The Tailor,” he continues his efforts to present the human mind in metaphorical language, using theatrical means in his search for substance. “The Tailor” is a play about culture and its relationship with humans. When the King, the scheming Tailor, the young Idealist, the beautiful Courtesan, and the hostile Barbarians step onto the stage, there begins an intense struggle, the pattern of which has repeated itself from one century to another. But the Tailor discovers a way (at least in the interpretation of some schools) of changing this pattern. The performance is in Estonian, with synchronous translation into English. 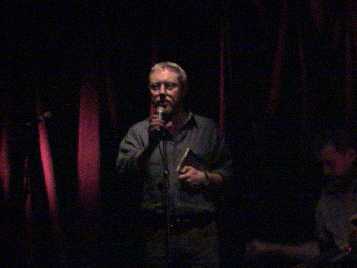 Brian 'The Godfather' Rooney at the Cobblestone, October 2006. 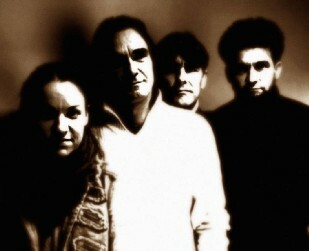 20.00 At the "O`Riada Hall"
Estonian musicians will be joined by Irish trad. players and singers. They really like to perform in their homeland. of the fact that most of the songs are in Estonian. This takes place in the framework of Estonian trade mission in Ireland; the visit of Foreign Minister of Estonia and Lord Mayor of Tallinn. The famous singers, the Johanson Family from Estonia, will be joined by some Irish Traditional musicians for a unique night of music and song from both traditions. A sister and three brothers really like to perform in their homeland. 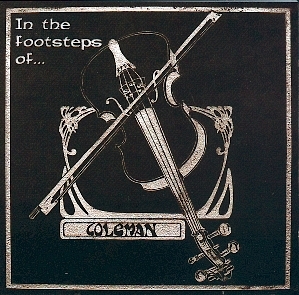 A rare concert from Brian ‘The Godfather’ Rooney (Fiddle) with Neil Mulligan (Pipes) and friends. Extract from their website : http://www.arangalicia.com/noticiasing. •GalÉire is ready to be posted! The price is 10€ plus the post, which depends on the country you are. If you want to listen our music, you can download 2 tracks of our CD, and listen the first minute of all tracks on the Dowloads section in our web (two of them are full). To order the CD is very easy, just mail us through the email section of this web. We hope you enjoy our music!. •Under this lines, GalÉire CD cover. 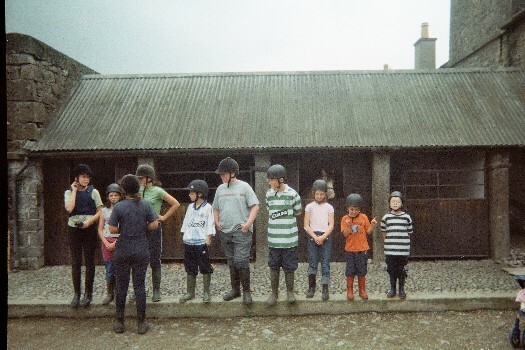 15th July to 22nd July 2006.
ceardlann déanta feag le John Mitchell ó Chorcaigh. Beidh rang breise againn le Steven Porter, is rang speisialta é chun deis a thabhairt do dhaoine nár thriall na píobaí ariamh(steve bocht). Ceolchoirm leis na múinteoirí ar 4.30 Beidh oíche neamhfhoirmiúil againn i siléir uí cheallaigh, tá súil agam go dtig leat fanacht. Tionól 11th of February,classes from 10-12 and 2-4,Tutors are Néillidh Mulligan, Éamon Ó Bróithe and Muirís ÓBrollacháin, we will have a special class to give people a chance to try the pipes for the first time, the tutor will be Stephen Porter,we will be able to supply a few practise sets but places for this class must be booked in advance.John Mitchell from Cork will host the reed making class. We will have a concert at 4.30 with the tutors and special guests. A night of informal piping is planned for the evening in Kellys cellars bar.more info from Cormac on 048 from south or 028 from north 90209193 or 07803501916 or cormacobriain@hotmail.com . 9th April 2005 at 8.00 p.m.
of the Castleknock Community College. Sunday February 13th @ 3.00pm. "The Piper in the Parlour"
NPU Heritage and Research Project. To familiarise participants with the skills required to compile, augment and maintain a cultural heritage archive and provide participants with general information technology skills to enhance their employment prospects. 11 months in Henrietta St., Dublin 1. Persons aged 18 years and over. Leaving Certificate standard desirable but not essential. A number of trainees with experience of Irish traditional music, a level of music ear training or/and an interest in historical research are required. Many years ago Séamus Ennis left his father James’s bagpipes in trust with my father Tom Mulligan. The pipes had no bag attached to them and had two boxes of chanter and drone reeds. The Ennis family have decided to donate this set of bagpipes to the Séamus Ennis Cultural Centre and this will take place at the Piping Recital as part of the Scoil Shamhna Shéamuis Ennis in Naul, County Dublin, next Friday at 8.30 pm. We will get an opportunity to see and hear them on the night when Dave Rickard will play them. From 12.00 to 4.30 pm on Saturday 3rd April 2004. Friday 22nd October at 8.00 pm. flute-player Eddie Duffy and fiddle-player Mick Hoy. On 12th July 2004 at 9.00 pm. in Gerties Canal Turn, Keshcarrigan, Co. Leitrim. Archaeologists are dancing with delight after discovering a set of musical pipes believed to have been used 4,000 years ago by prehistoric man in Ireland, making them the world's oldest wooden instruments. Archaeologists discovered the six wooden pipes, which are not joined, during excavations of a housing development site near the coastal town of Greystones, south of Dublin. "It is brilliant, absolutely fantastic," Bernice Molloy, site director for archaeological consultancy firm Margaret Gowen said. "It is an amazing find. They had been preserved because they were in the lower part of the site which was damper," Ms Molloy said. Experts have been able to play a series of notes, including E flat, A flat and F natural, on the yew wood pipes. The pipes were discovered in the bottom of a wood-lined trough. The archaeological team had been excavating a burnt mound believed to have been a cooking site when it came across the trough. A wooden peg used in the construction of the trough has been radio carbon dated to between 2,120 BC and 2,085 BC, which falls in the Early Bronze Age period. Ms Molloy said the hollow pipes, measuring between 30 centimetres and 50 centimetres long are tapered at one end but have no perforations or finger holes. "I have so far been unable to find any older wooden instrument," said Margaret Gowen, who owns the consultancy that made the discovery. "It appears to be 1,000 years older than anything I can find on record, certainly in Europe. "There is a suggestion of an early Chinese composite instrument like pan pipes with a gourd that is the wind chamber going back to about 1500 BC, but that is an illustration rather than the instrument," she said. Ms Gowen added that a 2,000 year-old sophisticated wooden pipe organ, dating from Roman times, had been discovered in Hungary. "In our case it is one of those accidents of survival and a wonderful one at that. It is going to excite quite a lot of interest," she said of the find. A number of prehistoric musical instruments made from bone, including simple flutes and whistles dating back more than 100,000 years, have already been uncovered in Ireland. The Piper Calls the Tune. A protege of greats like Leo Rowsome and Seamus Ennis, not to mention his own dad, Tom. 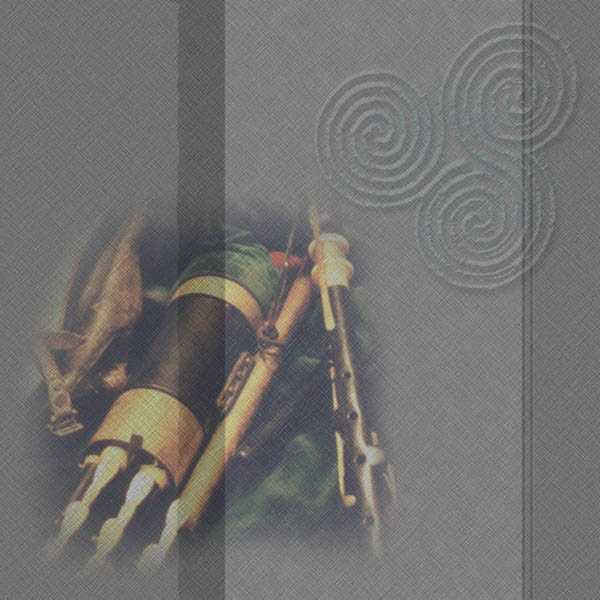 Neillidh Mulligan is steeped in the greatest traditions of ulleann piping. 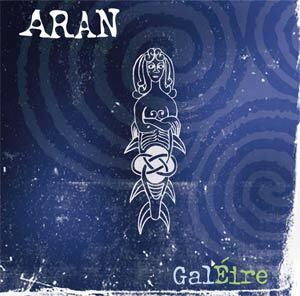 His third album, An Tobar Gle (The Bright Well) proudly maintains these rich traditions with a masterful display of top tunes. In an age of hybrids and cultural crossover, it's also refreshing joy to hear the pure art of the musician. Neil Mulligan "An Tobar Glé"
RTE Radio 1 producer Peter Woods is making a series of documentaries called More Than Museums on various topics of interest over 15 programmes which are being broadcast over the coming weeks on Thursdays at 7.02 p.m.
Peter interviewed me for his documentary next Thursday 29th January which will be about the Uilleann Pipes and comes from N.P.U in Henrietta Street. 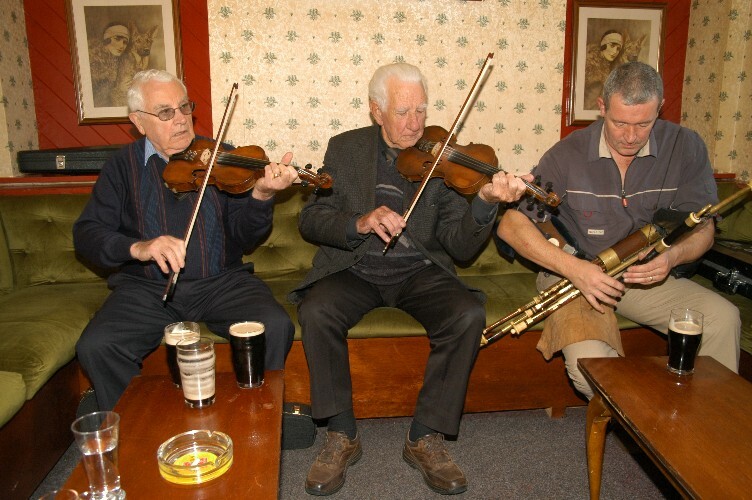 This year’s Festival, commemorating Eddie Duffy and Mick Hoy, will feature Music Workshops in Fiddle, Flute, Tin Whistle, Accordion, Set Dancing and Singing. The Opening Concert will be in Tir Navar at 8.00 pm on 10th October. The Derrygonnelly launch of An Tobar Glé will be at 1.00 pm in the Knockmore Lounge on Saturday 11th October. This will be followed by a concert at 2.00 pm in the Knockmore Lounge. Sessions in all the hostelries throughout the weekend. I have been invited to perform at Pibau Pencader this year in Pencader, Carmarthenshire, Wales. The festival, which is a bagpipe festival, is being held from 17th - 19th September 2003. Photos od Joe Mooney Summer School which were Taken by Lewis Blevins from Nashville. This was unique occasion when I decided to teach my pupils Gormans Reel(One of many such named reels- e.g see The Leitrim Thrush) beside the famine graveyard where he is buried in an unmarked grave, hence the plaque. For the story of Johnny Gorman see O Neill's Minstrels and Musicians where there is a full page on him. The fifteenth annual Joe Mooney Summer School of traditional Irish music, song and dance will be held between 19th and 26th July 2003 in Drumshanbo, Co. Leitrim, Ireland. Piping tutors are Néillidh Mulligan and Mikie Smyth. at the Lahemaa International Bagpipe Festival in Palmse, Lahemaa, Estonia. will be officially launched in the Baltics. North West Launch of An Tobar Glé. Last Night (Thursday) saw the launch of the of Neillidh Mulligan’s new CD "An Tobar Glé" in the Cobblestone. First on stage was Neillidh who played solo and he was joined by his son Fiachra (on Fiddle) and they treated us to very enjoyable selection of tunes. 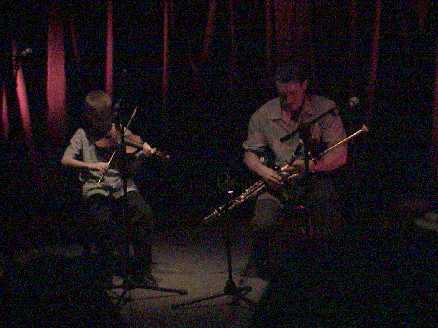 After Fiachra had finished Neil was joined on stage by Seán Ó Broin (on Flute) and later by Harry Bradley (on Flute). The music was flowing and was very well received by all. Neil would like to thank all that made the night so enjoyable with special thanks to our brother Tom for the venue, Neil will up a full report on the launch early next week. I am delighted to say that my new CD, An Tobar Glé, will be ready over the coming weeks and I will celebrate it’s launch in the Cobblestone on 26th June next around 8.30 pm! If anybody is interested in a signed, advanced copy they will be available in about two weeks, including P and P, for €20.00 or $20.00 or stg15.00 by cheque payment. 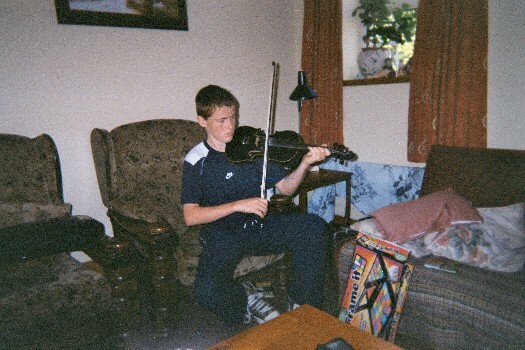 CD reviews by Paul Carr of "The Cobblestone Sessions"
Notation for "Tom Mulligan's Hornpipe" and "The Standing Abbey"
A link to the story of young Micky Doran, grandson of Felix Doran who was taught by his father Micky Doran Snr. Here's to another great piping occasion!